A team of researchers from the University of Oviedo and the Instituto de Astrofísica de Canarias (IAC) have discovered and characterized a Super-Earth type exoplanet orbiting the inner boundary of the habitable zone of the red dwarf star K2-286 (spectral type M0). Orange: inner edge of the optimistic habitable zone of K2-286 with albedo A=0.8. Yellow: same with A=0.2. Green: habitable zone limits for the conservative model. Black filled circle represents the location of K2-286b. The team analyzed data coming from the Kepler Space Telescope in its extended mission (K2), designed for detecting exoplanets using the transit method, and obtained new ground-based data at the Roque de Los Muchachos Observatory on La Palma. They used the instruments HARPS-N installed at the Telescopio Nazionale Galileo and OSIRIS at the Gran Telescopio Canarias. The star K2-286, located in the constellation of Libra, and at a distance of 76 parsecs (244 light years) from Earth, has a radius of 0.62 solar radii and an effective temperature of 3650 °C. The planet, with a radius of 2.1 times the Earth radius, an orbital period of 27.36 days and an equilibrium temperature of 60°C, is located at the inner limit of the zone of habitability. Therefore, under right conditions, it could keep liquid water in its surface, a necessary requirement for the development of life such as we know it. 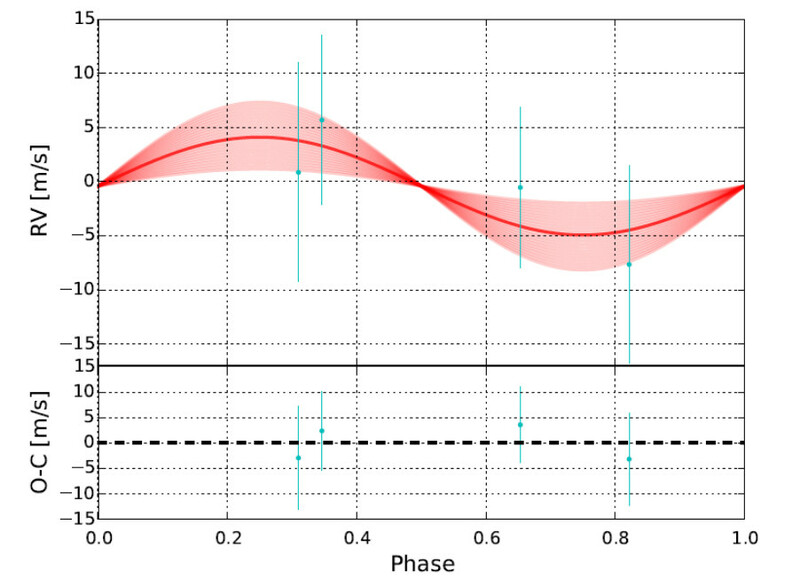 "The precise data of the HARPS-N instrument installed at the Telescopio Nazionale Galileo allowed us to measure the moderate activity of the star and to fix a limit for the mass of this planet", says Borja Toledo, a PhD student at the IAC and co-author of this work. "We have verified that the activity level of the star is moderate, compared with other stars of similar characteristics, this would increase the chances of the planet being habitable", add Javier de Cos and Enrique Díez, researchers of the University of Oviedo. The planet is of special interest not only because it is in the habitable zone of its star, but also because it is among the most suitable targets for atmospheric characterization. Indeed, “This exoplanet could be an appropriate candidate for a new generation instrument like ESPRESSO, recently installed at the Very Large Telescopes at the Paranal Observatory (ESO, Chile)”, adds Jonay González, Ramón y Cajal researcher at the IAC and also co-author of the article. “We are very proud to see how Harps-N data could be useful to point out the most interesting cases among the thousands of exoplanets discovered up to now”, comments Ennio Poretti, Director of the Telescopio Nazionale Galileo.